Policy discussions on the long-run earnings reductions that workers experience after they lost their jobs due to a negative trade shock often focus on labour market frictions that slow down or prevent workers’ movement from declining sectors to growing ones. My answer is both yes and no! The Danish system is successful, for example, in keeping workers within the labour market, providing them opportunities for re-employment in expanding sectors. But studying the nature of the costs that were borne on Danish workers by increased import competition from China reveals structural challenges that all workers face, whether American or Danish, when a trade shock hits them. In this column, I will describe why and how workers can experience long-run reductions in earnings despite minimal inter-sectoral moving frictions – even in a geographically small country with active labour market policies. In Utar (2018) I show, using administrative records of workers matched with data on their firms, that import competition from China causes the displacement of workers not just from their firms but from their industry. It drives workers to subsequent re-employment in the expanding service sector, and this is the case for all types of workers, whether production floor or office workers. That is, import competition from China leads to a broad sector switch. Danish workers do not suffer from long breaks in their work trajectories before finding full-time employment in other sectors – yet, as I show below, finding full-time employment in expanding sectors is not enough to ensure a smooth recovery. The emergence of China was felt as a major competitiveness shock especially in the textiles and clothing sector where the traditional comparative advantage of low-wage countries is compounded by trade liberalisation (abolishment of the Multi-Fiber Arrangement quotas) through China's entry into the WTO. As China benefited from trade liberalisation in the form of the removal of import quotas in the US and the EU on its textile and clothing products starting from 2002, the substantial decline in prices of textile goods triggered industrial re-structuring in Denmark following a strong decline of firm sales and employment and the dropping of existing product lines (Utar 2014). The total employment in the textile and clothing industry decreased by half from 1999 to 2007. Many of the remaining firms refocused away from manufacturing activities, where China has a substantial comparative advantage. But what happens to the workers? By matching firms to quota products and workers to firms, I identify workers who, in 1999, are employed in manufacturing a good that will later experience heightened competition via the removal of quantitative restrictions. Similarly identifying workers employed in the same industry, but not directly impacted by the removal of quotas because their firm was not producing a quota-protected product, lets me construct a counterfactual case. Following both groups of workers employed in the textile and clothing industry before the removal of quotas for China from job to job, sector to sector and in and out of education or unemployment, I provide a true-to-life documentation of workers’ adjustment to the trade shock over the decade that follows. I document significant negative long-run effects on earnings and employment of Danish manufacturing workers due to increased competition from China. And the reduction in earnings stems from having to leave the manufacturing sector for service jobs. In Denmark, active labour market policies ensure fast inter-sectoral movement of displaced workers towards expanding sectors, namely services, and the results show that workers can easily find jobs in the service sector. Further investigation also reveals that the service jobs workers find are overwhelmingly full-time jobs – not part-time. Since all displaced workers in Denmark are under the protection of the active labour market policies that include job search help and subsidised training for new employment opportunities, this is not surprising. But I also show that adjustment problems do not end with finding a full-time job in a growing sector. In fact, this is where they begin. 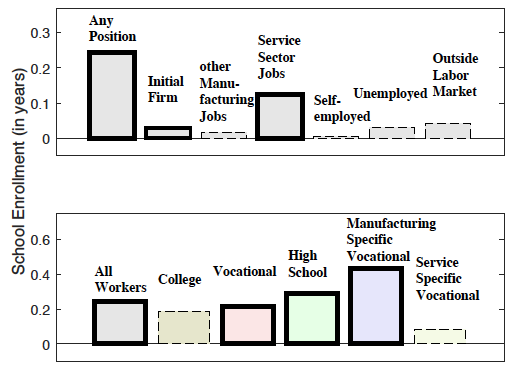 Figure 2 illustrates the importance of workers’ occupations in their adjustment to the trade shock. Each bar represents the causal effect of the import shock on the occupation group written at the top of the figure. (Statistical significance is indicated by solid-line borders, as opposed to dashed lines). The top part of Figure 2 shows the effect on the cumulative earnings nine years after the start of the shock. The bottom part shows the effect of the import shock on the cumulative earnings obtained from the firm where the worker was employed before the shock. 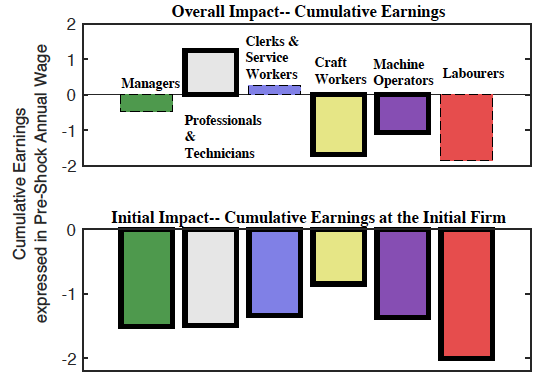 Comparing the long-run impact at the top of Figure 2 with the earnings impact at the initial firm (bottom part) provides a first hint to how workers adjust. The initial impact of the shock is quite similar across workers with different occupations. Managers, professionals and technicians, clerks and service workers, and machine operators all experience approximately one and a half year’s annual wage reduction from the original firm. But the long-run impact is quite heterogeneous. Despite the same initial impact of the shock, clerks, and service workers fully recover their earnings loss over the course of nine years. Machine operators, on the other hand, experience one year’s loss of wage. 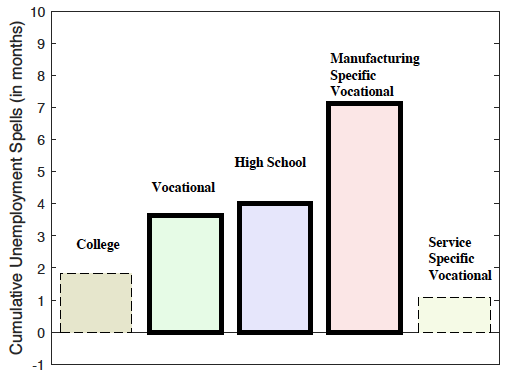 Using the detailed occupation information (the four-digit International Standard Classification of Occupations, ISCO) and education (diploma levels and titles) of workers, I establish a causal link between the manufacturing specificity of workers’ occupation and education, and the success of their adjustment to the increased competition from China. Figure 3 shows the impact of the import competition on unemployment spells (measured in months) experienced during the nine post-shock years, depending on workers’ education. Competition-induced unemployment is the most severe, not on the least educated (workers with at most a high-school diploma), but on workers with manufacturing-focused vocational education. I further show that the majority of unemployment spells follows an employment in the service sector. Workers' ability to recover from the shock depends on the degree to which their human capital is either relevant to work in the service sector or is lost because of the trade shock. Figure 4 shows the impact of import competition with China on school enrolment depending on workers’ positions in the labour market (top) and, separately, on their initial education (bottom). Workers enrol in school due to import competition mostly after they have moved to the service sector, and the skill mismatch with the service sector is the main driver of trade-induced school enrolment. This figure illustrates that as the opportunity costs of time spent out of the labour market decreases for workers with depreciated human capital, the import competition with China induces workers to re-build human capital through further education. In the end, Danish workers’ experiences were smoothed by income transfersand active labour market policies. Earnings losses were largely covered by unemployment benefits. However, frequent unemployment spells experienced, especially after moving to the service sector, would indicate that the satisfaction workers get out of their new jobs declined substantially. The challenges faced by manufacturing workers, who once exemplified the middle class, have important implications for the whole society. My findings show that adjustment problems do not end once manufacturing workers find full-time jobs in the growing service sector. And the Danish labour market institutions, despite being successful in keeping the workers within the labour market and ensuring fast inter-sectoral movement as well as largely covering the earnings losses of workers with transfers, were not fully successful in relieving the pain of the people whose human capital is not relevant for service sector jobs. In the end one feels better when earning a living rather than getting a transfer, and when enjoying and taking pride in work rather than changing from one job to another due to skill mis-match. Thus, it may be unavoidable that a sudden and obligatory shift toward a new sector demanding new skills leads to dissatisfaction. Although, the social system in Denmark may be a factor in keeping the dissatisfaction within limits and preventing unwanted political consequences. Autor, D, D Dorn, and G Hanson (2013), “The China Syndrome: Local Labor Market Effects of Import Competition in the United States”, American Economic Review 103(6): 2121-2168. Autor, D, D Dorn, G Hanson and J Song (2014), “Trade Adjustment: Worker Level Evidence”, The Quarterly Journal of Economics 129: 1799-1860. Ebenstein, A, A Harrison, M McMillan, and S Phillips (2014), “Estimating the Impact of Trade and Offshoring on American Workers using the Current Population Surveys”, Review of Economics and Statistics 96(4): 581-595. Freeland, C (2012), “As Jobs Go Global, U.S. Workers Pay”, New York Times, 2 February. Hakobyan, S, and J McLaren (2016), “Looking for Local Labor Market Effects of NAFTA”, Review of Economics and Statistics 98(4): 728-741. Keller, W, and H Utar (2016), “International Trade and Job Polarization: Evidence at the Worker Level”, NBER Working Paper No. 22315. Pierce, J R, and P K Schott (2016), “The Surprisingly Swift Decline of U.S. Manufacturing Employment'”, American Economic Review 106(7): 1632-62. Utar, H (2014), “When the Floodgates Open: "Northern" Firms' Response to Removal of Trade Quotas on Chinese Goods”, American Economic Journal: Applied Economics 6(4): 226-250. Utar, H (2018), “Workers beneath the Floodgates: Impact of Low-Wage Import Competition and Workers' Adjustment”, Review of Economics and Statistics. Utar, H (2018) “Online Appendix for Workers beneath the Floodgates: Impact of Low-Wage Import Competition and Workers' Adjustment”. Ebenstein, Harrison, McMillan, and Phillips (2016) and Hakobyan and McLaren (2016) also show blue-collar American workers experience wage reduction due to import competition over the 1990s. Christia Freeland and the New York Times initiated a discussion speculating that the consequences of the China shock in the US as documented by Autor, Dorn, Hanson (2013), Pierce and Schott (2016) and Autor et al. (2014) may be the result of the American system; see here and here. See Utar (2018) Online Appendix for “Workers beneath the Floodgates: Low-Wage Import Competition and Workers’ Adjustment” for details of this figure. The nature of the occupational change induced by the import competition with China is such that it leads to job polarisation at the aggregate level in Denmark (Keller and Utar, 2016).